Since 120 years the ski has been just a plain board.The skier has got nothing but the long ski edges to turn and brake. In 2006 we happened to mount two fins on the ski tail. Just to make them cut the snow surface whenever skier presses them in the snow. 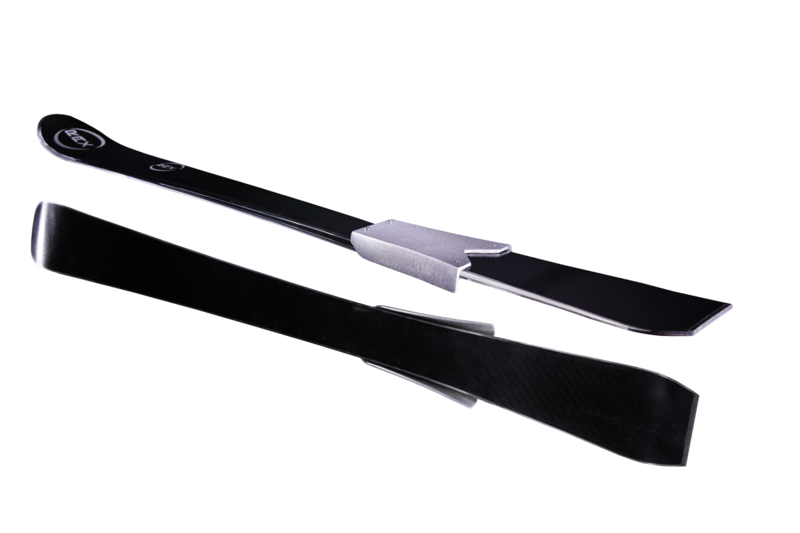 Suddenly this new ski could track much better than all other skis with their “carving” edges. Why? Simply because the cutting edge of the thin metal “fin” must carve better than long ski edge. This was the birth of the Rax Ski as “the Ski with rear fins”. Then we have found a foundry to cast the two fins integrated with the ski tail. Such a “bracket” could be mounted on normal skis. Since 2009 more than thousand pairs have been sold worldwide, mostly via internet. Patents pending. The feedback from skiers and freeriders was mostly positive, yet one could assume that this ski invention had more potential to offer. In Autumn 2014 we bent the rear fins like radical carving edges such turning them into “Carving Fins”. Hundreds of skiers tested them until 2018 and so helped us to fix the final version of the “HighTech Carving”. The skier initiates a carved turn the same way he is used to with his conventional ski – he puts his ski on edge. But the further execution of the turn is amazing: it`s like running in a circular rail, a pure carving with no slipping aside. Even on ice or hard bumps! The physics of ski movement surprised us with two additional phaenomena: the new “Carving Fin” is cutting turns of any radius “just on edge” and avoiding the danger of knee injuries at the same time. This is how PHOENIX, a ski with short, bent „Wings“, emerged from the ashes of the expiring Carving-Era.